Established in September 1969, the Founders Medal s one of the most distinguished awards given by Baylor University to those whose service and contributions have been unusually significant to the life and future of the University. WACO, Texas (Feb. 1, 2019) – On the 174th anniversary of its founding, Baylor University today presented the Baylor Founders Medal to the City of Waco for its decades-long support of and partnership with the University. As one of the University’s most distinguished awards, the Founders Medal was established in 1969 to recognize those whose service and contributions have been unusually significant to the life and future of the University. The University will publicly recognize the City and its partnership throughout the spring semester, including at athletic events, an upcoming Waco City Council meeting, the February Board of Regents meeting and a reception later this spring at Waco Hall, among other events. Waco Hall: Waco Hall was built in the late 1920s with the help of the Waco community assuring Baylor University’s permanent location in Waco, Texas. Construction on Waco Hall began during the presidency of Samuel Brooks and was dedicated May 27, 1930. McLane Stadium: In July 2012, the Waco City Council unanimously approved $35 million in Tax Increment Financing Zone support for construction of McLane Stadium (known then as Baylor University stadium project). The funding supported public improvements associated with the stadium, such as roads, sewer pipes and power lines, as well as a public marina and $13 million footbridge over the Brazos River. The $35 million represents the biggest economic development contribution in McLennan County history and propelled stadium construction forward. Baylor Regents voted to approve construction within days after the City’s contribution. Lake Waco Wetlands: In 1998, the Waco City Council voted to increase the Lake Waco Pool by seven feet. This decision guaranteed Lake Waco had sufficient drinking water to supply most of Central Texas. As a result, a 180-acre Lake Waco Wetlands was constructed on Lake Waco as partial fulfillment of replacing habitat that was lost when the lake was raised. The Center for Reservoir and Aquatic Systems Research (CRASR) housed here became a research and education partnership between Baylor University and the City of Waco focused on aquatic resources. Baylor Research and Innovation Collaborative: A project conceived in 2008 became the Baylor Research and Innovation Collaborative (BRIC) in 2013, thanks to partners such as the City of Waco and Waco Economic Development Corp. The BRIC assembles under one roof all the tools and services necessary to take innovative ideas all the way from concept to the marketplace. With a staff of researchers spanning virtually the full range of scientific and technological inquiry, full-featured laboratories, prototyping and testing facilities, technical workforce training capabilities and business formation and augmentation services, BRIC clients have available to them every facet of product creation, development and marketing required for success, as well as the option of having an on-site presence at the BRIC. Waco Mammoth National Monument: In 2006, plans were initiated to make the site of the discovery of 22 Columbian mammoths, a camel and the tooth of a saber-tooth cat a public park. With the combined support of the City of Waco, the Waco Mammoth Foundation and Baylor University, this goal became a reality. The Waco Mammoth Site opened to the public in December 2009. On July 10, 2015, President Barack Obama signed an Executive Order designating the Waco Mammoth National Monument as the 408th unit of the National Park System. Baylor University Shuttle: The Baylor University Shuttle (BUS), a fixed-route transportation system operated by the City’s Transit System, offers free rides to hundreds of Baylor students weekly along five repeating campus routes. Waco Symphony Orchestra: Prompted in 1961 by members of Waco Chamber of Commerce, Baylor University School of Music Dean Daniel Sternberg developed plans for restarting a city symphony (after a failed effort in 1939) that would enhance Waco’s cultural offerings. In 1962, the Waco Symphony Orchestra began its first season. The Symphony continues to be conducted by Baylor faculty, currently under the baton of Dr. Stephen Heyde. Start Up Waco: Start Up Waco is a nonprofit organization developed through collaboration between community leaders, the city of Waco and Baylor University to lead Waco’s efforts to support entrepreneurial growth and elevate Waco as a hub for business innovation. The organization’s physical co-working space called Hustle is located in the Woolworth Suites in downtown Waco. In this space, entrepreneurs find an abundance of resources in one place from mentoring and interactions with other successful small-business owners to a resource library and programming to foster startup growth. Before Texas was a state, Baylor University’s charter was officially signed on Feb. 1, 1845, by Republic of Texas President Anson Jones. 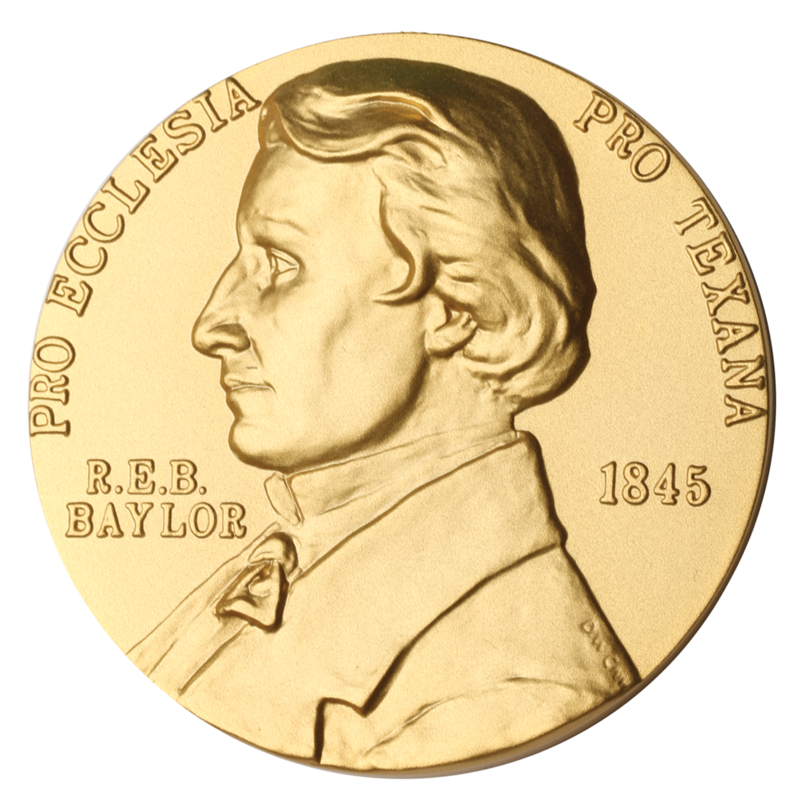 Each year, the Baylor community celebrates its founding by presenting the Founders Medal. Past recipients of the Founders Medal include such local philanthropists and University supporters as Drayton McLane Jr., Jane Meyer, Mary Russell McCall, Ted and Sue Getterman, Harold and Ann Cunningham and Baylor Presidents Samuel Palmer Brooks, W.R. White, Abner V. McCall and Herbert H. Reynolds. A full list of past recipients is available here. A copy of the Baylor Founders Medal is on permanent exhibition in the National Numismatic Collection at the Smithsonian Institution in Washington, D.C. The face of the medal bears the likeness of Judge R.E.B. Baylor, with the inscription Pro Ecclesia Pro Texana. The obverse bears the likeness of Pat Neff Hall with the inscription “Baylor University Founders Medal,” plus the name of the recipient and year of presentation.